Mayo really is the Ireland of your imagination, come and discover this beautiful and inspiring region. It’s hard not to fall in love with Mayo, here you will have brilliant moments and make memories that lasts a lifetime. Expect the unexpected and your experiences will make your break truly exciting. Come and discover our wild unspoiled nature and get in touch with our rich heritage and history. Mayo is a hidden treasure! Travel along the Mayo section of the Wild Atlantic Way and pick your part of the Atlantic coastline to explore. Climb Croagh Patrick, the Holy Mountain of Irish people. Come just in time to enjoy yourself. Discover the many festivals and events. Mayo’s towns and villages will capture your heart, blend the peace and solitude of the villages with the taste of our lively towns. Mayo is Wild Nature. Take a trip and discover a hugely diverse landscape. Discover inspiring drive itineraries, choose the one you like the best. Are you dreaming about an action packed, fun-filled holiday or a relaxing break inclined to more gentle pursuits? Mayo is the right choice for you. Visit Ceide Fields, an unforgettable archaeological site in North Mayo. 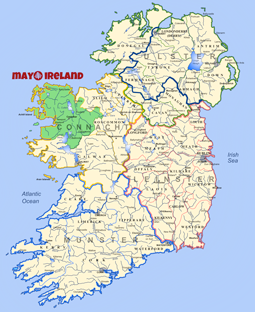 Welcome to our site on County Mayo in the west of Ireland. Here you will find all kinds of information about our amazing county and enjoy planning your break with great accommodation deals, helpful travel advice and inspiring ideas for what to see and do. Be amazed at our breathtaking landscapes and fascinating countryside. Discover the spectacular scenery of the many lakes, explore the green and peaceful valleys, walk up to the peak of wild mountains or experience challenging outdoor activities. Appreciate the stunning islands and stretches of coastline; take pleasant strolls on the wonderful, yet unspoiled, beaches and enjoy the pure and crystal waters. Mayo people are warm and friendly and take pride in making our land your land. We are the most welcoming people in Ireland! Take part in our charming region. Here, there is always time for a special moment and remember there is a corner of Mayo with your name on it waiting for you.